and i want to say a very extra special big heart felt thank you to everyone who donated funds last week. I continue to be amazed by the generosity of spirit of this wonderful community. HUGS! FIRST! The winner of this week's Zentangle Pocket Pages, supplied by the wonderful folks at CropStop! and lucky commenter #28 was..... me? Poor Diana at Wolf Howlings was having trouble commenting on the blog. (I'm sorry, i'm not sure what happened there - i'm trying to fix it. ) So, she sent me an email letting me know she was trying to comment, so i added her comment for her... and she's the lucky recipient of this week's giveaway! Diana, email me with your mailing address and we'll get those sent off to you post haste - courtesy of CropStop! My email address is in the contact tab above. Didn't win this week? never fear, you can order your own Pocket Pagez or you can try again this week! (rules posted in blue at the bottom of this post) Receive 10% off at the Crop Stop when you use the coupon code DIVA - awesome! Well, what we thought was the flu last week turned out to be Strep throat... only, it never went away - it just kept getting worse and worse and poor B-rad just never got any better and ended up being home from work all week long. 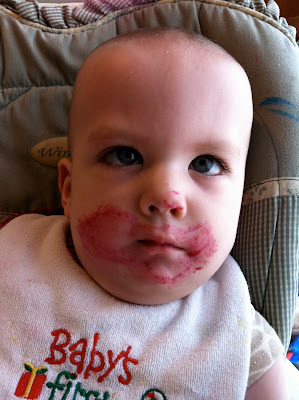 Because, as it turns out, it wasn't actually strep either. It was Hand Foot and Mouth Disease. And by some amazing miracle - i came out of it unscathed (knock on wood) and i was able to care for my super sick hubby and my sick little dudes, who also had it. Because Hand Foot and Mouth is pretty contagious, this meant that all four of us were stuck in the house... together... alllllll week..... and, i mean, i love my family but by the end of yesterday i was feeling pretty ready to run away and join the circus. Unless you've been living under a rock, you know that October is Breast Cancer Awareness month. I don't know anyone who doesn't know someone living with, or affected by, or lost someone to Breast Cancer. A few months ago i shared with you that my grandmother's breast cancer has returned. So i was working on a piece for auctioning, which (because of my crazy life) i didn't actually get to send down to my aunt. However, i did finish it. Yes, October is Breast Cancer Awareness month, and yes, my grandmother and even my aunt have or have had Breast Cancer. But Breast Cancer is not the only reason to have hope. i think each of us has had a situation in their lives when they felt like giving up, and for whatever reason - they didn't. That gives me hope. Sometimes, as some of you know, my life is hell. But i hope every day that things will get better. I hope that my kids stay healthy. I hope that my sons know how much i love them, i hope my husband knows how much i adore him. I hope for the strength to get through each day. Most of the time, for me, hope is just the tiny light in the darkened room that helps my eyes adjust over time so i can maneuver through the obstacles that are in front me. We all need to have hope. This week the challenge is to create a tile or ZIA inspired by hope. However this applies to your life. This contest will close as of MIDNIGHT CST on Saturday. 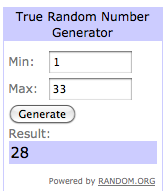 I will use a random number generator to select the winner from the comments on Sunday. I will announce the winner in next week's challenge! This contest is open to everyone, including overseas!! yay!! Your boys are adorable, as ever. Hope you remain well, and everyone else is recovering. How in the world did you find time to do a slide show?? What a week..... I hope this next week will bring you relief from struggles. I am happy to tangle about hope. Thank you again for challenges that open my mind to thought. By the way, the boys look great! Sounds like a wonderful challenge and a good subject, HOPE, to ponder for awhile. Thanks. I HOPE your household gets back to a good normal this week! This is such a great challenge, Laura. Sorry to hear flu season is striking already. We are on our second round of colds and even my hubbie had an ear infection. I feel your pain. I love tangling with words so looking forward to this one. Thanks for the challenge and for always sharing your story. I'm #7...Great challenge...I HOPE that things get better for you! Love this challenge... although it stumped me, at first! Thanks for working so hard on these challenges, Laura! I'm #7 on Mr. Linky. I'm # 11. What another wonderful challenge, thank you so much, I am sure I would not produce as many tiles if I did not have something to work at. You are a star and give such support to everyone. Sending hugs. A fantastic challenge again, And also exactly what I expected in this October (breast cancer) month. I hope for you that things will go better! Laura keep that HOPE strong!! Hope family has recovered and doing well. Thank you for the challenges, they make me pause and think on things that we take so much granted for. #19 - What a wonderful theme. Thank you! Not sure if you can remove busted links, but #21 is incorrect (your linky tool is too clever and added an extra http://), so my #22 entry is fixed. Loving all the submissions so far. I'm number 24. Laura, your hope, strength, and courage are really inspiring. I think of you often. Laura, thank you for your stories. 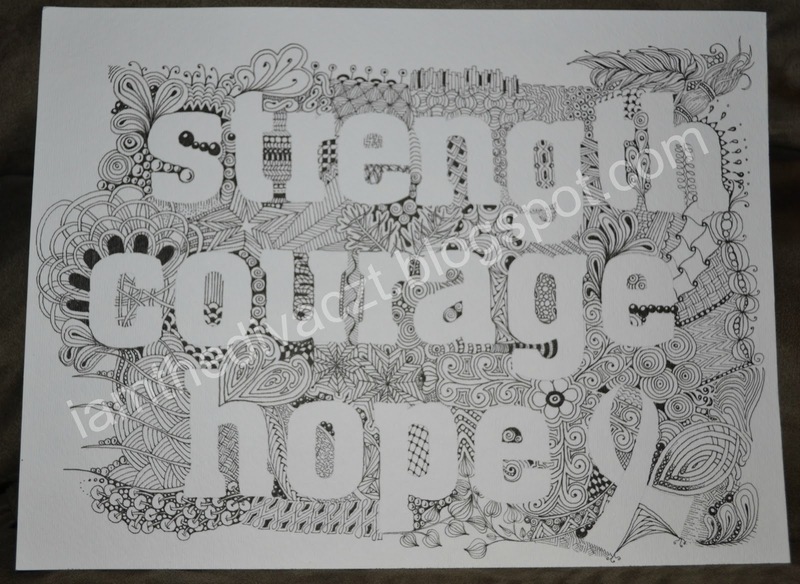 Your "Strength, Courage, Hope" piece is beautiful! Should be #27 which is my hubby's fav number! Perhaps there will be hope in that! Your challenges have hooked us (KNM and I) since the no.38, and we have been thoroughly enjoying the ‘tango-tangling’, as Maria put it. 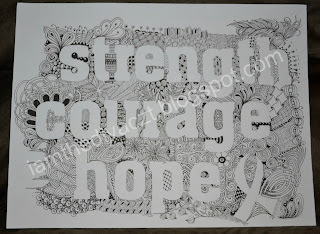 The present challenge on ‘hope’ offers variety of ways to express through Zentangles. One can look at hope from the personal level to the Global. I have chosen to address it at the global level. A tree as symbol of hope flashed in my mind, what with the ‘global warming’ posing a huge threat to the very existence of human kind! Trees, perhaps, can save us. I picked up almost all the names of your September participants to be present in my ‘hope’ tree. It’s a challenge within the challenge for all to find their individual leaves..:-). You, Maria and Rick, ‘appropriately’ are at a special location! Search it out!! By the way, your current life account is a great example of triumph of hope over struggles. Kudos! I am number 28. Thrilled to be able to participate and sending HOPE your way especially this week Laura. Healing wishes for you and your family! I hope that everyone is feeling better. This was a very thoughtful challenge thanks! I am # 29. This was a very thought provoking challenge as hope means so many things. Thanks for the week of reflections! I am #32 with a sun that has yellow for light, pink for the breast cancer ribbon. Suns always mean hope for me -- especially a sunrise. Thank you again, as always, for an amazing challenge. And thank you for all the other entries that I love to visit and admire! Hello! I made a real mess of up-loading my site specific URL this time, so please disregard numbers 35 &36 on the submissions list. Finally got it right at number 40! I blame it on an anniversary dinner and a glass of red wine! So sorry everybody, and especially the lovely Laura who is such an inspiration. Hope is what you exemplify Laura. Hi, I'm #41 - Hope is the thing with Feathers - inspired by the poem by Emily Dikinson. Loved this challenge, again! Thank you, thank you. I'm number 20!! This week I'm #42...and it's challenge #42! Have a good weekend! Great challenge. I am number 46 this week. YAY I finally got one added before then ending. Nice to be here again. I hope all goes better for you and your family Laura, thanks for keeping our minds thinking. Hi, Laura....I've been away and now am back in the game!! Sorry to hear of all your troubles! Hope everything is better now! I am number 50 (also 49 but it is incorrect!) I am trying to figure out how to remove # 49! I am number 51. I chose to do 3-dimensional chipboard letters. Fun format to work with and another awesome challenge. Oh Laura!! I hope things get brighter soon!! Your boys are just adorable!! I hope you stay fine, and everyone feels better soon!! Thank you so much for finding the time to give us these prompts and inspire us every week!! You are awesome!! I'm comment number 37 and linky number 53!! I would love to win!! I'm crossing my fingers this time!! LOL!! I'm #55. I really found this week's Challenge particularly timely - about 100 of us from literally all around the world are gathering in Providence, RI, next week for CZT training. That is a real example of hope, I think. Thanks, Laura! I'm #60. Thanks again for another awesome challenge. I hope your hubby and your boys are feeling better. 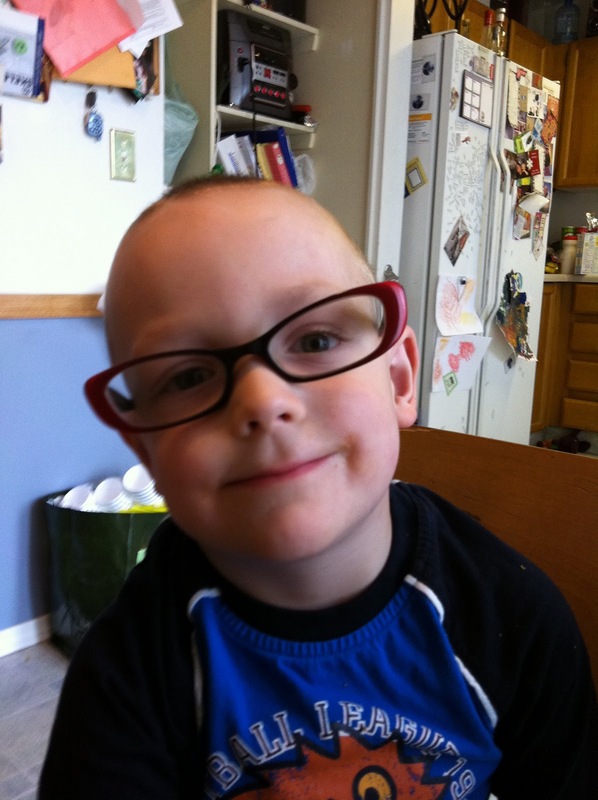 Wonderful challenge - coming in at #62 - Laura - here's hoping life is on the mend at your house. Be well. Strength and hope hand in hand. Zendala for me and my friend who is recovering from surgery. So excited that I got a challenge done - I've not finished one in weeks!